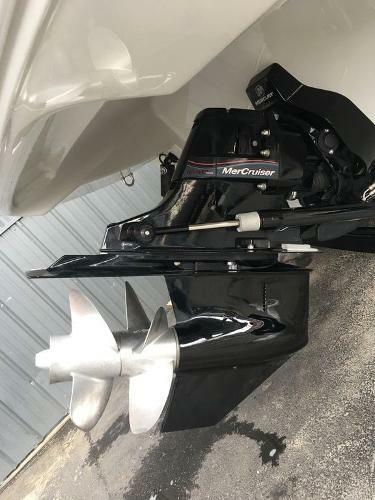 2016 Crownline 335 SS Promo Package, Check out this 2016 Crownline 335 SS Promo Package! MSRP: $225,319MAKE US A REASONABLE OFFER!! !Standard Features: Mercruiser Twin 350 MAG Bravo III Catalyst 600HP, 12 V Receptacle, 25 Gallon Fresh Water Tank, Adjustable Flip Up Double Helm Seating, Aft Facing Social Swim Platform Seating, Anchor Roller, Automatic Bilge Pump (3) Manual Override, Automatic Fire Extinguishing System, Battery Charger, Bow Flip Up Heavy Duty Arm Rests, Canvas Bow and Cockpit, Cockpit Floor Storage, Cockpit Wetbar w/Sink, Solid Surface Accent & Sink Cover, Color Matched Interior, Countertop, Faucet, Handrail & Refrigerator, Compass, Companionway Lockable Door, Crystal Cap Letters w/Crownline Logo, Depth Sounder w/Outside Air and Water Temperature, Diamond Anti-Skid Surface, Digital Gauges, Dockside Water Receptacle, Docking Lights, Dual Battery Switch, Electric Lift Engine Hatch w/Secondary Quick Charge Terminal, Enclosed Head Compartment w/Luxurious Cherry Finish Custom Cabinetry, Sink, Shower Sump Pump & Electric Flush Head, Extended Swim Platform w/Four Step Boarding Ladder, F.A.S.T. Tab, Vented Hull Chine w/Reversed Chines and Delta Performance Pad, Fire Extinguishers (2), Fully Integrated Cockpit Fiberglass Liner, Gelcoat Narrow Hull Band, Hand Held Shower Freshwater, Cold, High Water Alarm System Audio / Visual, Hour Meter, Interior Color Matched L-Shape Cockpit Seating w/Port Convertible Lounge, Magnetic Windshield Catch, Navigation Lights, Port Console w/Glovebox, Rack and Pinion Steering, Soft Touch Swim Platform Mat, Speakers (8) All Exteriors Upgraded to WetSounds and Amplified, Stainless Steel Rubrail w/White Extrusion, Stereo -Polk Premium Stereo: Waterproof, AM/FM/WB/USB/Sirius XM Ready/iPod & iPhone Controls & Charging/Bluetooth, Sunbed w/Three Position Lean Back Seating, Tilt Steering Wheel, Transom LCD Remote, Transom Trim Switch, Trim Tabs w/Indicators, Walk Thru Transom, Cabin w/Seating and Wood Accents, Cabin Filler Cushions, CO Detector, Color Coordinated Throw Pillows and Opening Portlight Windows w/Screens.Additional Options: Mercruiser Twin 6.2L MAG Bravo III Catalyst 600HP, D.T.S. 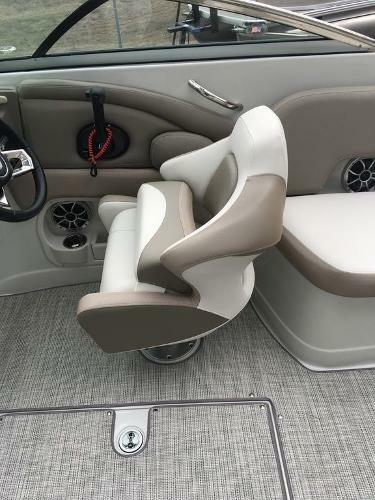 (Digital Throttle & Shift Control w/Twin Engines), Driftwood Woven Mat, Raymarine A97 - Touchscreen MFD w/Engine Information, Bow Flip Up Arm Rests, Side Mount Table, Cockpit Seating Module (Exch. 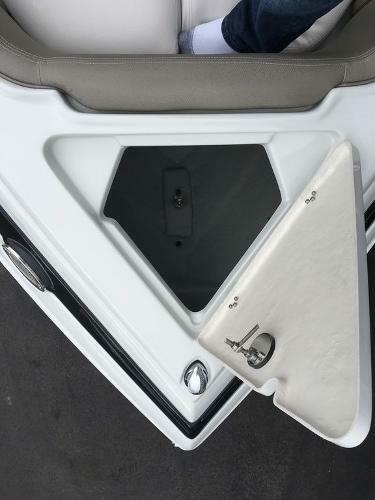 For Cockpit Wet Bar), Wood Flooring (Maple Tone), Exchange for Standard Sapele, Bow Canvas, Cockpit Canvas, Battery Charger, Docking Lights, LED Lighting - Cockpit w/Add'l LED Lighting on Arch, Transom Trim Switch, Trim Tabs, Oversized 12 X 20, Underwater Transom Lighting w/Twin Engines, Windlass w/Rope & Chain, Flat Screen TV w/DVD Player, Polk Premium Stereo(Waterproof, AM,FM,WB,USB,SiriusXM Ready,iPod& iPhone Controls & Charging,Bluetooth), Wet Sounds Speaker Upgrade for All Speakers, Moonstone Marquis Aluminum Arch w/Rear Bimini (Only), Hand Held Shower (Cold Fresh Water Washdown at Stern), Electric Flush Head w/Holding Tank and Pumpout, Builder's Certificate and Platinum Interior Upgrade.